If you want to undo all changes you made in a file since your last commit you need to select the file, right click to pop up the context menu and then select the command TortoiseGit → Revert A dialog will pop up showing you the files that you've changed and can revert. Select those you want to revert and click on OK. If you want to undo a deletion or a rename, you need to use Revert on the parent folder (or commit or repository status dialog) as the deleted item does not exist for you to right-click on. If you want to undo the addition of an item, this appears in the context menu as TortoiseGit → Delete (keep local). This is really a revert as well, but the name has been changed to make it more obvious. The columns in this dialog can be customized in the same way as the columns in the Check for modifications dialog. Read the section called “Status” for further details. Revert will only undo your local changes. It does not undo any changes which have already been committed. If you want to undo all the changes which were committed in a particular revision, read the section called “Log Dialog” and the section called “The Repository Browser” for further information. If you want to undo a whole commit, then you should use the log dialog and select Revert change by this commit on a revision/commit (cf. the section called “Log Dialog”). Then all changes of this commit are undone and a revert commit is created which need to be committed manually (cf. the section called “git-revert(1)”). It is also possible to (hard) reset to a previous commit, then all commits after that are forgotten (cf. the section called “Reset”) - this might not be recommended if the changes are already pushed (also see https://stackoverflow.com/q/27032850/3906760). When you revert changes you may find that the operation takes a lot longer than you expect. This is because the modified version of the file is sent to the recycle bin, so you can retrieve your changes if you reverted by mistake. However, if your recycle bin is full, Windows takes a long time to find a place to put the file. The solution is simple: either empty the recycle bin or deactivate the Use recycle bin when reverting box in TortoiseGit's settings. 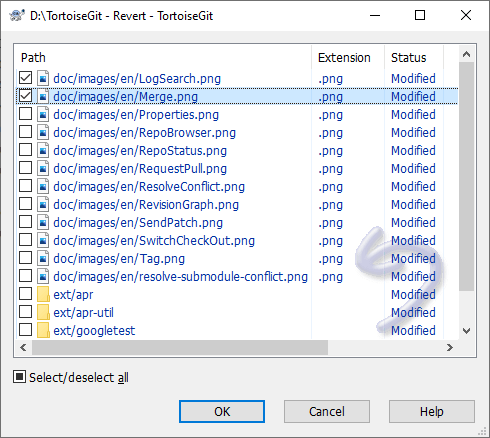 In the TortoiseGit naming a "revert" on a file is comparable to git checkout HEAD -- filename (or git checkout REVISION -- filename) for resetting a file to it's last (or a specific) committed state. This has nothing to do with the section called “git-revert(1)”! the section called “git-revert(1)” is only referred to by Revert change by this commit in log dialog (cf. the section called “Log Dialog”).